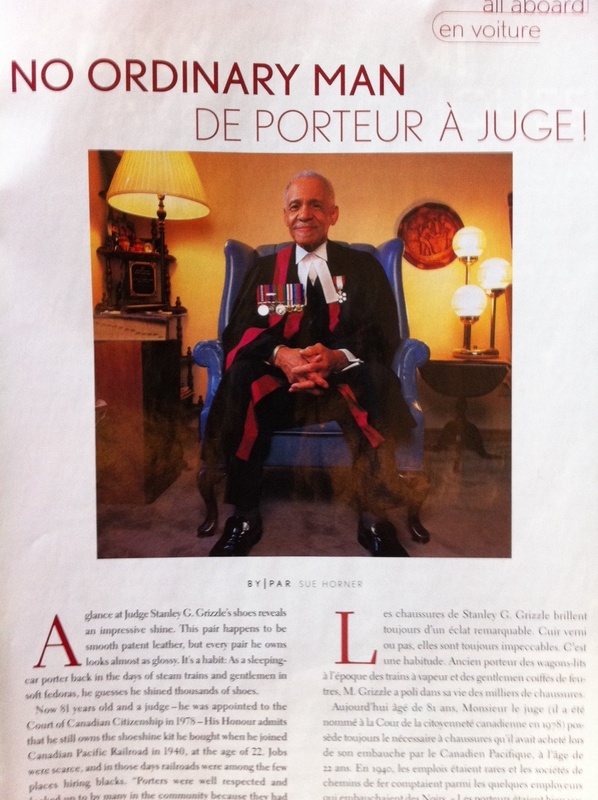 A glance at Judge Stanley G. Grizzle‘s shoes reveals an impressive shine. This pair happens to be smooth patent leather, but every pair he owns looks almost as glossy. It’s a habit; as a sleeping car porter back in the days of steam trains and gentlemen in soft fedoras, he guesses he shined thousands of shoes. 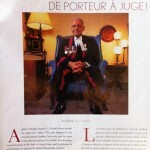 Now 81 years old and a judge — he was appointed to the Court of Canadian Citizenship in 1978 — His Honour admits that he still owns the shoeshine kit he bought when he joined Canadian Pacific Railroad in 1940, at the age of 22. Jobs were scarce, and in those days railroads were among the few places hiring blacks. “Porters were well respected and looked up to by many in the community because they had steady employment,” Grizzle recalls in his book, My Name’s Not George: The Story of the Brotherhood of Sleeping Car Porters in Canada. For 20 years, Grizzle made up and put away the berths that typically lined either side of the sleeping-car passageway (usually 12 upper and 12 lower), and also looked after up to three more pampered passengers secluded in a private compartment. While passengers slept, he shined the shoes left under the lower berth, kept the washrooms clean and stocked with towels, mopped floors and emptied spittoons in the men’s smoking room at the end of the car. These days, Judge Grizzle still regularly meets people with different experiences. Although supposedly retired in 1983 (“they keep calling me back”), he interviews prospective citizens to make sure they meet the qualifications. Twice a week, he presides over a downtown Toronto courtroom, administering the Oath of Allegiance in English and French, and handing out certificates to newly-minted Canadians. He keeps careful records of their countries of origin (over 100 so far), and makes a point of learning to say “Welcome” or “Good day” in Spanish, Portuguese, Polish and Cantonese — and that’s just for starters. He can still talk to just about anyone. Hi Edward, sorry, I did not keep my files. You might see if the Citizen Court still has his contact information, although it appears he has finally retired.